Npc10000, or NPC, giving you an npc10000 review. I’m going to be reviewing “Jungle Monky” by ironmonkey. WHO? : Ah, ironmonkey. Renowned on the Forums, he is rather unheard of on the Main Site. When I noticed that this game was featured, I had to give it a shot. THUMBNAIL: To me it looks like your average maze game. It seems intricate and well-crafted though, not thrown together. The blue orbs also interested me. What are they, enemies? Who knows? Time to play. STORY: Hmm. No noticeable story. Oh well. Anyways, I discover that you have to drag the monkey's hands around the screen and latch onto the sides of the walls and work him around spikes and other malignant things. This is the first time I've seen the concept, and I thought it was very creative and original. But it was hard, too! 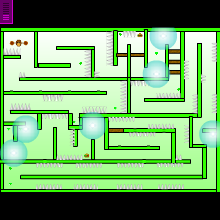 The player has to work the monkey's body through gaps and corners and every which way, and at the same time avoiding those spikes. I did enjoy it, however, even though it took me almost seven minutes to finish Level 1. Doing little things like that was dangerous, though, because if you punched through to hard, you would smack into a spike -_- Also like I said before, you have to mind yourself when working around corners, because a wrong move would send the monkey cascading into a spikebed. The way some of the 1-ups were positioned too took me a while to work out, because one wrong move and the monkey was stuck between the walls. The puzzles, although a bit sparse and spread out, still added up nicely. SCENERY/ART: Eh, I could say more for the scenery. But, however, this was one of those games where scenery didn't really matter, because it was fine as a couple of green walls and floating dirt blocks. ENEMIES/HAZARDS: Ag, those spikes were the bane of me. So positioned so evilly, you had to take care and plan out a way to get around them. And, in Level 2, there were these spinning flower things that released a blue sphere of death every couple of seconds, and let me tell you, dragging the monkey's hands across the diameter of death and making sure his stupid body wasn't in the way was a monkey on my back. HEALTH/POWER-UPS: What? The "coins" you have to collect? Are those Chaos Emeralds? Trite and cliched, says I. And as I discovered, extra lives came in the form of scrumptious hamburgers. This I have to disagree with, as the more hamburgers you eat, the more your risk of heart attacks increases. In a Sentence: A challenging puzzle game that could have been decorated better. Feature-Worthy? : I'm, as Young says, "on the fence" with this one. While it is challenging, the fact that it only has three levels may be the sand that tips the scales. However, it was featured already, so I'm going to have to say "yes." - this has been an npc10000 review. Here are some of Sploder's friendliest members! Watch this space daily for more!